The number of investment deals in India’s food and agriculture sector dropped to its lowest level since at least 2014 but a handful of big-ticket transactions pushed up the overall deal value to a five-year high, according to a report by VCCEdge, the data research platform of VCCircle. The food and agriculture sector recorded 80 deals until the end of October, compared with 140 last year and 164 in 2016, according to the VCCEdge’s Food and Agri Report 2018. The report, which was released at the News Corp VCCircle Food and Agri Investment Summit 2018, held in Mumbai on Thursday, showed also that the total deal value jumped to around $2.83 billion so far this year from $982 million in the entire 2017. The spike is due to private equity firm TPG Capital and sovereign wealth fund Abu Dhabi Investment Authority agreeing to invest $1.2 billion in a unit of UPL Ltd to back its acquisition of US-based Arysta LifeScience Inc. for $4.2 billion (Rs 28,900 crore). The food-tech segment accounted for one in every three deals in the food and farm sector over the past five years, the report showed. It also made up a third of the total deal value. 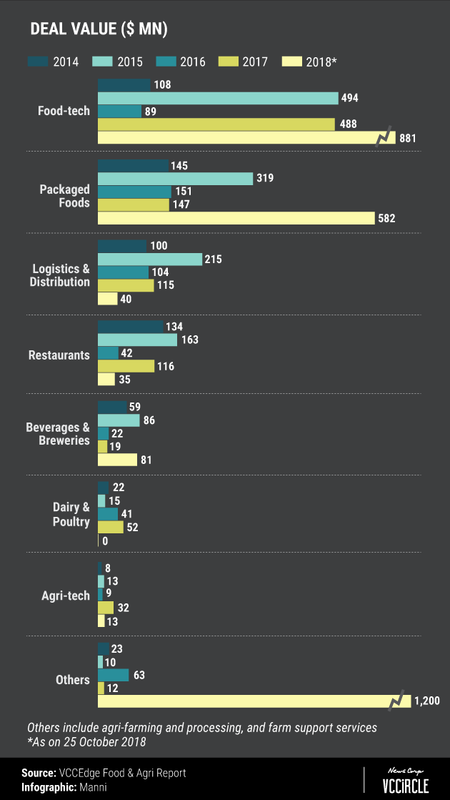 The number of deals in the food-tech segment this year is the lowest in five years, but the total deal value is the highest. Food-tech companies Swiggy and Zomato have raised substantial capital in multiple transactions this year. In February, Swiggy had raised $100 million (Rs 640 crore) in a Series F round led by South African technology conglomerate Naspers. In June, it raised $210 million (around Rs 1,400 crore) in a Series G round led by Naspers and Russian billionaire Yuri Milner-led DST Global. Zomato also hit headlines with Chinese e-commerce giant Alibaba's payment affiliate, Alipay, agreeing to invest $200 million in February. Last month, Zomato signed a pact to raise $210 million from Alipay. The heavy investments in Zomato and Swiggy come at a time when competition in the food-tech segment has been intensifying. UberEats, the food delivery business of the US-based ride-hailing firm Uber Technologies Inc., entered India last year while homegrown cab-hailing major Ola acquired the Indian business of food delivery platform Foodpanda from its German parent Delivery Hero in December last year.